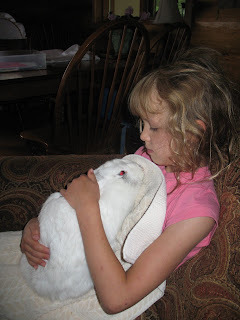 G. has been asking for a rabbit for well over a year. For her birthday, we thought a dog would be better...more fun, less poop? But after Violet started her biting phase, and her leash pulling phase and her jumping up phase, G. reminded us that she 'asked for a rabbit'. So, after I saw an ad at the corner store, for someone selling rabbits, we decided to take the plunge. 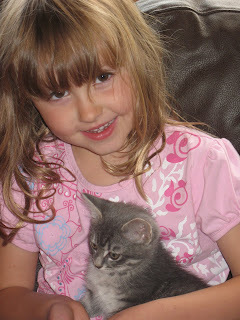 As we were talking about it V. reminded us that she had always wanted a cat and we said she could have one, once we moved to our property...as it would have to be a barn cat, as Erich is allergic. Mittens is crazy cute...I have never been a cat person but I really like this cat and she is super easy to care for. She was instantly litter trained (she is way too small to be an outside cat right now...so thanks to Reactine she will be indoors for now) and provides us with endless entertainment as she tries to climb the logs on our house or stalks, then attacks a fly on the floor...or a peice of lint. 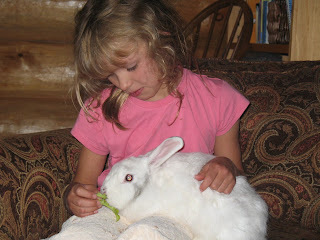 Hopper is an Angora rabbit, and apparently his coat is spinnable if you mix it with a little wool. You 'harvest' it's hair by just gently pulling on clumps when it gets really long (kind of like when a dog sheds it winter coat). He is very calm and let me cut out a few matted clumps of hair, so I think he would be happy to sit and have his hair thinned. G. is still getting used to the rabbit's frequent pooping, and picking him up is still a bit difficult as his claws are quite sharp and his feet hopping about as he gets comfortable with us. He is six months old and spent the lat few months in a cage that was way too small for him...I don't think lack of attention or exercise will be a problem here. He has a big dog crate to live in and a fenced run to hop around in...if he ever gets put down that is. I would think it would take a long time to collect enough rabbit fur to spin a skein of yarn - but I'd try it! That rabbit is BIG! I know...the poor fellah didn't get much exercise. Apparently, their hair can grow up to three inches long...so we will wait and see...maybe we will have to get another one...which will end up with another few...etc, etc, etc...maybe not.